When is the 2019 Rugby World Cup (RWC) and where is it? When is the 2019 Rugby World Cup (RWC) and where is it being held? What is the Rugby World Cup? Formed in 1987, the rugby world cup is a men's rugby union tournament that takes place every four years. Only the top 20 international rugby teams can compete, and the winning team are crowned as the rugby world champions. 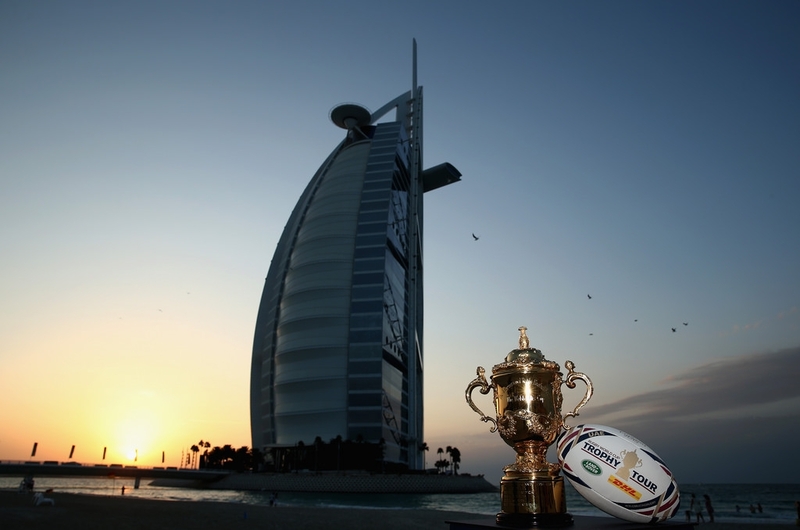 Where is the next Rugby World Cup being held? The 2019 tournament will be hosted by Japan. 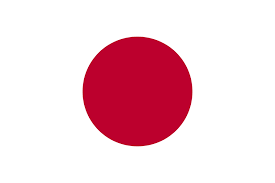 This is the first time that Japan has hosted the competition. In May 2009 Italy, Japan and South Africa were selected as potential hosts. In July 2009 it was confirmed that Japan would be the official hosts of the 2019 tournament. What date is the Rugby World Cup 2019? The tournament officially starts on Friday the 20th of September and finishes on Saturday the 2nd of November. The opening match kicks off at 19:45 local time (11:45 UK time) with Japan V Russia at the Tokyo stadium. 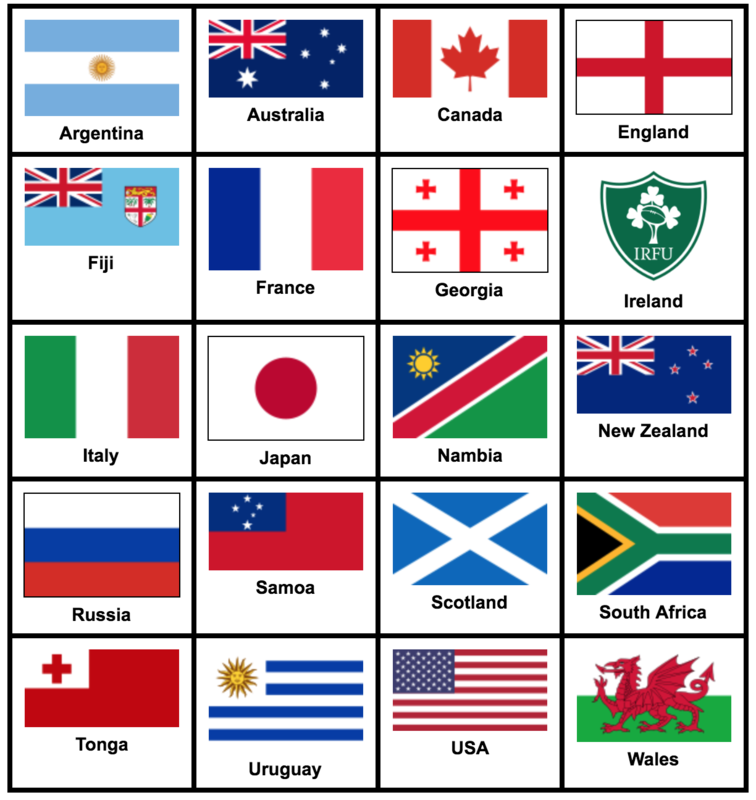 How many teams are in the 2019 Rugby World Cup? 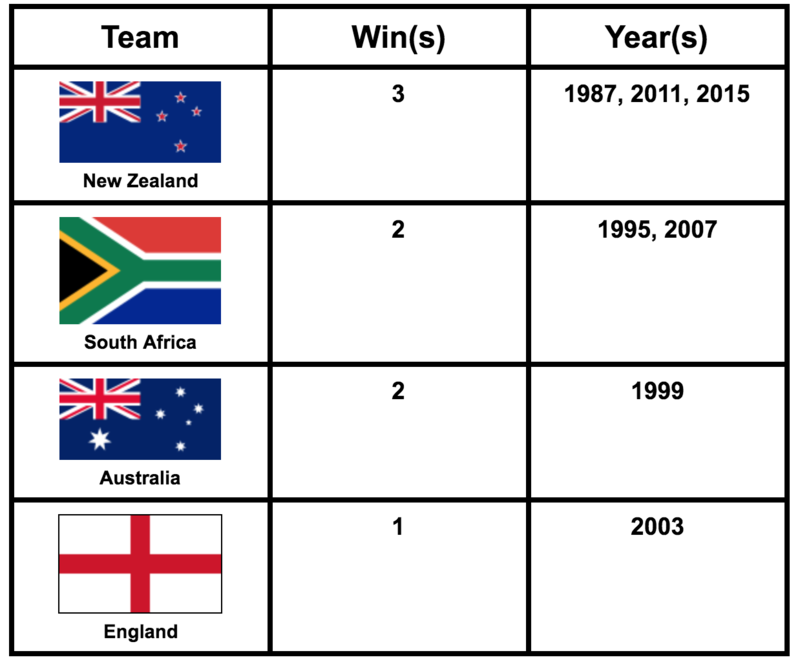 Which countries have won the rugby world cup? Who will host the 2023 Rugby World Cup? In 2023, France will host the Rugby World Cup for the 3rd time. They previously hosted 8 world cup games in 1991, 8 games in 1999 and 42 games in 2007. The year 2023 will also mark the 200th year anniversary of the invention of rugby. How often is the Rugby World cup? The rugby world cup takes place every 4 years and is held by a different nation each time. Sometimes multiple nations host games in the same tournament. There have been 8 world cup competitions so far. 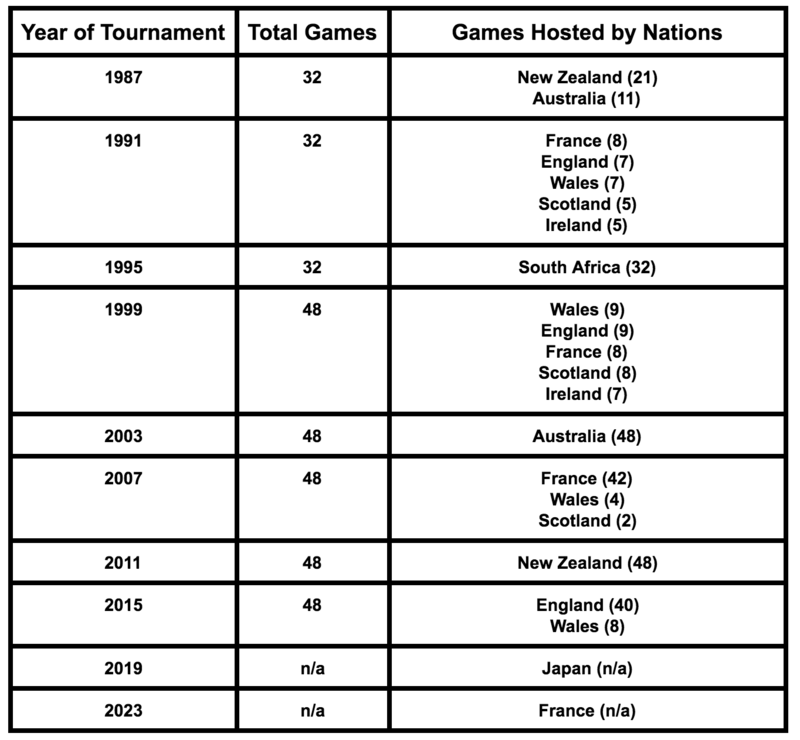 Below is a list of all the host nations and the number of games they have hosted. What is the rugby world cup trophy called? The Webb Ellis Cup is the rugby trophy awarded to the winner of the rugby world cup. The highly regarded rugby union trophy is named after William Webb Ellis who is thought to have invented rugby when he picked up the ball during a football match. Has England ever won the rugby world cup? England has won the tournament once at the Telstra Stadium in Sydney, Australia. On the 22nd of November, 2003, England managed to beat Australia 20-17 in front of 82,957 spectators. When did the rugby world cup start? The original rugby world cup tournament was hosted by both Australia and New Zealand in 1987. A total of 32 games were played between the 22nd of May and the 20th of June. New Zealand took home the title with a 29-9 win against France and became the first rugby world cup champions. How long is a rugby world cup match? 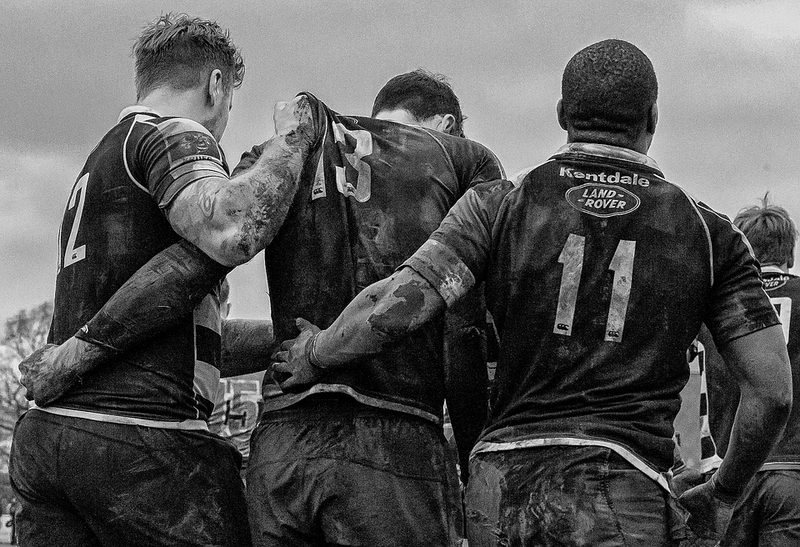 A rugby match is traditionally 80 minutes long. This is split into two 40 minute halves with a 10-minute interval in-between. Additional time is sometimes needed to help break a tie or to make up lost time for injuries, substitutions or foul play. How many players in a rugby world cup team? There are 31 players in a world cup rugby team. Each team consists of 6 back row players, 5 props, 4 centres, 4 Locks, 3 scrum halves, 3 hookers, 3 wings, 2 fly-halves, and 2 full-backs. Are you a rugby player? At Jackson Trophies, we have a huge range of rugby trophies, medals and awards that are ideal for celebrating the achievements of your team and your star players. Head over to our rugby trophies section to take a look at our great selection.